Three second half goals from MK Dons saw off Northampton Town on Tuesday night to set up a mouth-watering tie with Premier League champions Chelsea in the FA Cup fourth round. After an evenly matched first half, Dons flexed their Championship muscles with Ben Reeves and Simon Church netting penalties either side of a Josh Murphy strike to win 3-0 and book their spot against Guus Hiddink’s side. The replay prompted Karl Robinson to make six changes to the line-up which started on Saturday against Reading - three of those changes came at the back. Matt Upson, Antony Kay and Lee Hodson stepped in for the suspended Kyle McFadzean, Jordan Spence and Joe Walsh. Josh Murphy and Darren Potter also made way, with Dean Bowditch and Ben Reeves returning to the starting 11. Before kick off, Dons were forced into a change with Nicky Maynard picking up an injury in the warm-up. He was replaced up front by Simon Church. With the stakes so high, it was a predictably tight affair in the opening half hour. There were tentative prods from both sides as they approached goal, but neither really forced the issue. David Martin made a decent stop from Sam Hoskins’ 18 yard strike to keep Northampton out, while Dean Bowditch was inches away from converting Rob Hall’s cross at the other end. Dons looked well in control and dominated the possession but looked void of ideas in front of goal. Smothered in the centre of the park, crosses were zipped across the face of goal but had too much on them for Church to get anything on. The home side were dealt a second injury blow shortly before half time, with the Matt Upson experiment once again coming up short. The former England defender was looking assured at the back and was reading the game well, but sank to the ground seven minutes before half time. Dejected, he was replaced by Joe Walsh. The game sparked into life in the second half, and the ball was in the net at both ends, but only one would count. 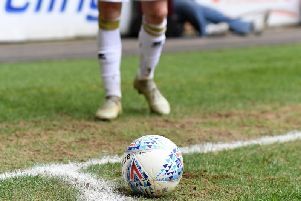 While Northampton thought they’d scored when David Martin was shoved behind the line from a corner, Dons went up the other end and took the lead courtesy of a dubiously awarded penalty. Dean Bowditch looked to skip past Zander Diamond but on the edge of the box was clearly tipped. Though the foul looked outside the area, referee Tony Harrington pointed to the spot with no hesitation. Ben Reeves made no mistakes from 12 yards to put Dons into the lead 11 minutes into the second half. Bowditch was unable to shake off the heavy challenge though and was replaced by Josh Murphy, who almost made an immediate impact. Skipping past Diamond, his strike rattled the frame of the goal, before sending another skidding just wide as Dons looked to double their advantage in quick time. Murphy wouldn’t have to wait long for his reward though as he doubled the lead just after the hour mark. Reeves did well to bring down Samir Carruthers’ ball, and with Church as decoy, Murphy was able to break clear on goal. Waiting for his moment, and for Smith to commit, Murphy neatly rolled the ball home to make it 2-0. With a cushion behind them, Dons looked as though they were more than happy relax in the remaining half an hour. The back four, although makeshift, withstood a spirited late charge from the League 2 side, who continued their valiant effort to give their fans something to cheer until late in the day. But it would be the home fans who’d have the last cheer as they were awarded another dubious penalty in the last minute to put a bow on the evening. As Hall raced through on goal, it appeared Smith made a good save to deny him, but the referee immediately gave a spot kick. After a battle with Jake Forster-Caskey, Church placed the ball and sent Smith the wrong way to ensure the Premier League champions would be setting course for MK1.